Neil and Jason in next week’s episode. SAD news today for Midsomer Murders fans. It has emerged that next Wednesday’s ITV episode will be the final appearance of Jason Hughes as DCI John Barnaby’s regular sidekick DS Ben Jones. ‘Schooled in Murder’ will be the last ever episode starring Jason Hughes as DS Jones, sidekick to DCI Barnaby played by Neil Dudgeon. He says: “It was a tough decision for me to go, as I have had a great time working on the show, both with John Nettles and now Neil Dudgeon, and the crew are like a second family. “I feel it is the right time for me to leave, and after spending 7 happy years on Midsomer I am now looking at other projects, and my first one will be the pilot season in the US. Producer Jo Wright of Bentley Productions is currently looking for the right person to replace Jason. Jason’s first episode was ‘The House in the Woods’ in 2005. He went on to film over 100 hours of Midsomer Murders starring alongside John Nettles in 38 episodes. 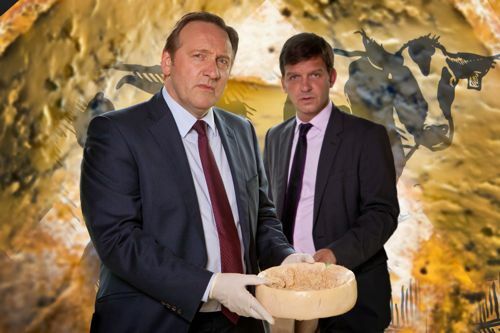 Since Neil Dudgeon took over the leading role, the latest detective duo have clocked up a further 14 episodes. Jason’s first day filming involved finding a dead body in a car, a foretaste of the many bizarre murders he then went onto investigate. As DS Jones, Jason has also been almost killed by a tractor, dressed up as a nun, fallen out of trees, and gone undercover in a cult. He has fallen in the lake in the middle of freezing January and sang naked in the shower. In that one, he was a bit shocked when he was told to take his boxer shorts off, and then found out that they had to dub over his singing anyway because of a rights issue! Jason’s other credits include This Life, Plain Jane, The Flint Street Nativity, Phoenix Blue, Killing Me Softly, Mine All Mine, Waking The Dead, Coming Up and Dante’s Daemon. Posted in Midsomer Murders, News and tagged ITV Drama, Jason Hughes, Midsomer Murders, Neil Dudgeon. Bookmark the permalink.